Thank you for your interest in our Kauai Vacation Rental. You will thoroughly enjoy a vacation to the Garden Isle of Kauai, there are so many beautiful beaches, delightful sunsets, hiking trails, parks, shopping centers, golf courses, island activities such as Na Pali Coast boat cruises, helicopter tours, luaus, kayaking, deep sea fishing, bike tours, horseback riding and scuba diving. Located one block from the longest stretch of white sand beach on Kauai, and below the entrance to Waimea Canyon. This spacious three bedroom, two bath plantation style house. Completely furnished and includes all amenities such as cable television, VCR, stereo, and fans. Sleeping accommodations are for 6, one king, one full, and two twin size beds. Kitchen is complete with microwave, and small appliances. Washer/dryer, beach equipment also available. BBQ, fishpond and waterfall. Liko & Debra Hookano have owned and operated this vacation rental since 1999 and will be able to help you see the hidden Kauai. We love the quiet neighborhood and sunny westside of Kauai. Completely renovated and decorated beautifully. Master Bedroom has A/C the rest of the house has fans. Basic seasonings and things like oil. Everything was as described. Great spot on the sunny south shore. Debra was very responsive and nice to work with. Thanks! Great home away from home, wonderful place & location! Loved Kuaui and our charming 50's Rental house was great! Friendly landlords,living close by, were very gracious. Good location for exploring! Lovely place and lovely people! Having a grill, beach chairs, coolers and umbrellas available to us and beautiful beaches so close was a real plus! Well equipped Kitchen and grocery close were so appreciated. Thank you so much Debra! We enjoyed our stay in this house. The owners live next door and have an open ear for problems and questions. There is a beach a few meters walk away. The only thing missing for us was a table and chairs on the lanai. Excellent suggestion about a table for the lanai. We love staying in this lovely home. It has everything you need , and is beautifully decorated. The beach theme/ modern rustic decor is light and airy and immediately helps you forget all about your to do list ! I highly recommend this property. We enjoyed having your family stay with us and look forward to hosting you again in the future. So nice to meet your family and we are glad you enjoyed Kauai and our rental home. My husband and I were traveling with our 11 year old and his two adult daughters and we had plenty of space for us all. We loved crashing in the living room in the evenings, grilling burgers for dinner and just lounging as if we were at home. The space is beautifully decorated and clean. The owner/host was very gracious and flexible with checkout and was never too far if we needed anything. The home is in a private little neighborhood and just two blocks from a small, dark sand beach where we sat on the rocks and caught the sunset multiple evenings. 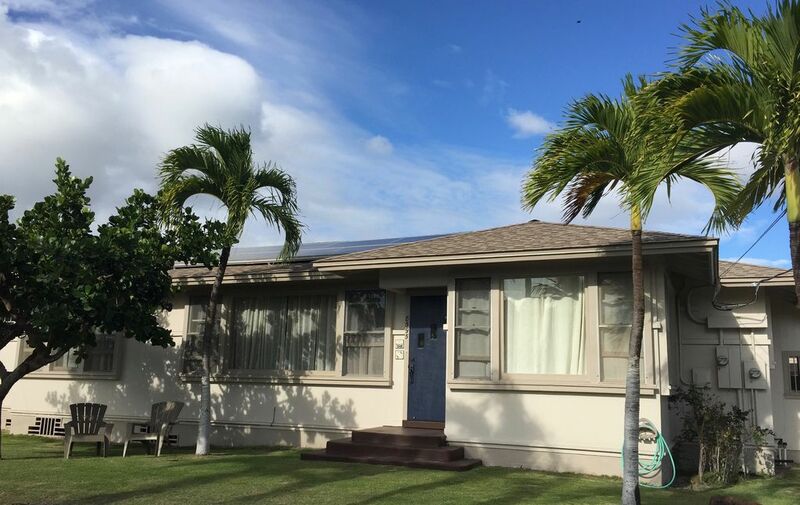 The home is located in Kekaha which is a quiet town, away from all the hustle and bustle (this is one reason we loved it). We were only a 2-3 minute drive from a stretch of beautiful sandy beach (Kekaha Beach Park) and just a short drive to many other popular destinations. Only 30 minutes to the top of Waimea Canyon, which is a MUST SEE! We took a Na Pali Coast boat tour which left the harbor just 5-10 minutes from the home and we found everything we needed was not far at all. We would definitely return, but the home may be best for the winter/cooler months as there is only one window AC in the very back bedroom. The other two rooms were pretty hot and humid. The ceiling fans help, but still a bit stuffy throughout. We also wanted to note that the "second bathroom" wasn't so much a bathroom as it was a toilet and shower off the laundry room. There is no sink or vanity so the main bathroom was used most often by all guests. Thank you again for a lovely place to stay, and for all the beach gear! We really enjoyed the home and our visit to the beautiful island of Kauai!